As the first of two coastal storm winds down across New Jersey on Tuesday, we're still tracking a more impactful storm system for later this week. Let's jump right in. Tuesday is starting out soggy, as a storm system continues to affect New Jersey. For the vast majority of the state, it's been a rainy overnight. However, I suspect part of North Jersey (above Interstate 80) has seen some snow and sleet mixed in (at least above ground-level). Roads are certainly wet and there might be big puddles and ponding issues. However, I do not anticipate any significant travel issues (i.e. flooding or icing) for the morning commute. The steadiest, heaviest rain will begin to taper around 9 or 10 a.m. Tuesday morning. Lingering showers and mist will remain possible through Tuesday afternoon. It will be cloudy and breezy and cool all day, with high temperatures about 50 to 55 degrees — probably warmer than the past four days. Skies will remain cloudy Tuesday night, and the breeze will remain up (10 to 20 mph). As thermometers dip into the lower 30s, the wind chill ("feels like" temperature) will almost certainly drop into the 20s. Bundle up! Wednesday will be a cold day. In fact, with high temperatures only around 40 degrees, it could be our coldest day since mid March! It will be a mostly cloudy although dry day. Any little breeze will add a bite to the cold air. Bundle up again! Wednesday night will be cold too. Downright wintry, in fact, with widespread 20s expected across the state. Bundle up some more! That pool of cold air will be a very important component of yet another coastal storm, which will come to visit New Jersey on Thursday. There's still some uncertainty in this forecast — particularly regarding the timing — but we're starting to get clarity on potential impacts. Timing? I'm still not sure I can fully trust model guidance yet, as the timing of this system continues to shift with every run. I think we're settling on a start time between Thursday mid-morning and midday. That would put the period of heaviest precipitation on top of us Thursday afternoon and evening. Rain may not wrap up completely until Friday morning. Wintry Mix? Yes. A period of snow, sleet, and/or freezing rain is probable at the onset (beginning) of this coastal storm's impacts on New Jersey. The best chance for some wintry weather will be along and west of the NJ Turnpike. While I wouldn't rule out some snowflakes closer to the coast, the marine influence will likely keep air temperatures above the magical 32-degree freezing mark for most of the storm's duration. Accumulation? Possible, but limited. I'm eyeing northwestern New Jersey (north of I-80, west of I-287) as the area most likely to see "mostly wintry mix" from this storm. Just to give you an idea of magnitude, raw model output averages 3 inches of snow accumulation and up to a quarter-inch of ice accretion. 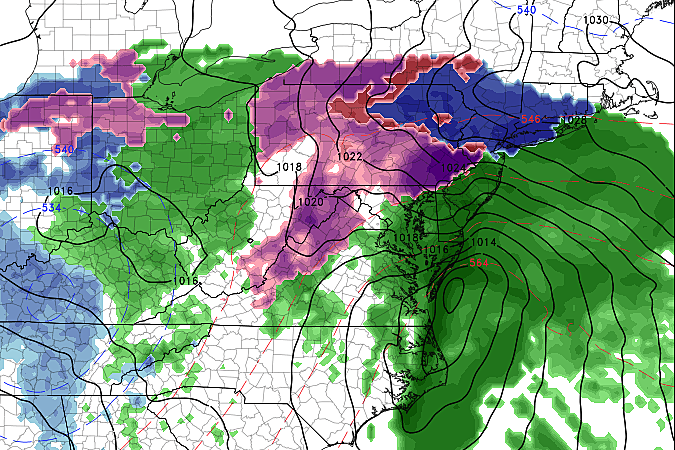 (The possibility for freezing rain and ice is far more concerning than snow and sleet, by the way.) I'm not buying those "the ground is too warm" theory — it burned me last December, and I'm not getting fooled by Mother Nature this year. Bottom line: Things could indeed get slippery by Thursday evening's commute. Rain? So it looks like the vast majority of New Jersey will see "mostly rain" from this system, and it could be heavy at times. Rainfall estimates fall between 1 and 2 inches for most of the state. Coastal Flooding? A period of gusty east-northeast winds are likely. That will potentially drive some water toward the Jersey Shore. With 1 to 2 feet of extra water popping up in the surge model, I am concerned that minor to moderate tidal flooding will occur. There is one significant advantage — the astronomical tide will be relatively low. A lower starting point means a smaller crest. (Hopefully.) The most precarious high tide cycles appear to be Thursday PM and Friday AM. Skies should clear by Friday afternoon, and we'll see plenty of sunshine throughout the weekend. High temperatures will remain chilly though, in the upper 40s to around 50. There could be some snow showers around Sunday night. No big warmup in sight.